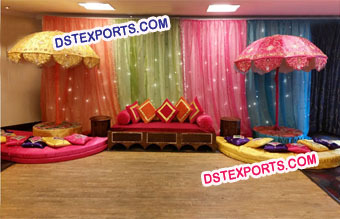 We are manufacturer and exporter of all types of Sangeet Wedding Decoration, Indian wedding stages, Reception stages ring ceromany stages, Asian wedding stages, Hindu wedding stages, Muslim wedding stages, Mehandi stage decorations. The Sangeet, of all the wedding functions, is one such evening that is most awaited not only by the couples� family but by everyone who�s invited. It�s the night of absolute fun where everybody joins in the joy surrounding the wedding celebrations through the simplest means of music, dance & entertainment!